Viv Busby, Terry Conroy, Garth Crooks. Steve Carney, Alan Shoulder, Terry Johnson. The 6th February is a date remembered as one of the darkest days in the British game due to events at Munich Airport in 1958, however fast forward 20 years to 1978 and it brought one of the FA Cup’s biggest ever upsets. 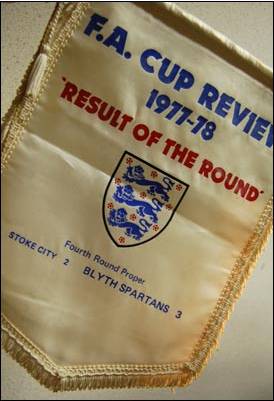 Northern League Blyth Spartans were playing their 9th game in a remarkable cup run that had started on a sunny September day in Shildon, County Durham and had brought them to a damp winter’s night in Stoke upon Trent, Staffordshire. Stoke City were having an indifferent season adjusting to life outside the top division of English football for the 1st time in 15 years following relegation. 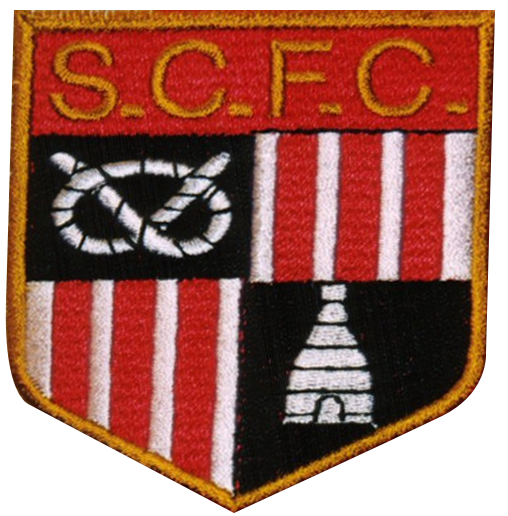 After an initial good start they had suffered a slump in form so a Fourth Round draw against the last surviving Non League club was seen as a perfect draw for the Potters. “Its going to be tough but it’s not impossible for us to win, Non League Hendon came to Newcastle 2 seasons ago and got a draw. This is the best Blyth team there has ever been and without doubt the best squad the club has ever had. We are slightly disappointed, because we wanted a more glamorous tie”. It wasn’t the 1st meeting between the 2 clubs though the previous was an FA Cup 1st Round clash on 13th January 1923. Then the Potters had just been Stoke FC it was 8 years before they changed to Stoke City FC (Stoke had been awarded City status in 1925). That first meeting saw the First Division side run out comfortable 0-3 winners so 55 years on Manager Brian Slane & Coach Jackie Marks were plotting revenge and were given a helping hand by Tyne Tees Television who made a recording of Stoke recent games available to the management pair. “Stoke are definitely beatable, we can do it. They have not been scoring a lot of goals and our defence aren’t conceding many, Dave Clarke has kept a clean sheet in our last 3 cup games and our attack will always get a goal or two. We just have to get out there and enjoy every minute, we must make the most of it. We won’t be going there with defeat on our mind”. Before game was played City Manager George Eastham paid the ultimate price for their poor season when he was sacked after only 10 months in the hot seat. Eastham had been Tony Waddington’s Assistant and took over when Waddington resigned in March 1977 with the club staring relegation in the face. “A new man might buck them up but as they are promoting their assistant manager, they will probably keep their old style. “There is no way that the departure of George Eastham will affect our players confidence, we are a professional side with a professional attitude. A Non League draw for us especially at home is a very good fixture for our players and our spectators. It gives us a good chance to get into the last sixteen and once there we would be only three matches away from the Final. My 1st game in charge would have been at home to Millwall but that was frozen off so this cup game is my first as manager and I’m expecting a good result for Stoke City!. “If we contain them for half an hour then they could be frustrated and it could be very an interesting game. They scored 2 in just six minutes against Tilbury but they won’t do that to us. Everyone I speak to says that Howard Kendall is the main man for Stoke, so he’ll be receiving special treatment from our players. We are ready, we are not worried, just excited we have nothing to lose, in a sense we have got to Wembley a far as a Non League club is concerned. The 4th Round was scheduled for Saturday 28th January, however despite the North East being in the grip of a snow storm 4,000 Blyth fans set off for Staffordshire early on the morning, including a convoy of 52 official coaches many had arrived in the Potteries only for the game the game to be called off an hour before kick off because of flooding!. Torrential rain overnight and on the morning of the game had put the game in doubt but the Stoke ground staff had worked hard to clear the pitch of gallons of water. The referee delayed his pitch inspection until 1.00pm, but a further downpour left him with little alternative other than to call the game off. The game was rearranged for the following Wednesday night, 1st February, and the postponement meant the club was placed in the 5th Round draw automatically and as if yet another incentive to beat Stoke was needed the winners of the rearranged tie would play either Third Division Wrexham or a struggling Newcastle United!. 13 official coaches were due to leave for the potteries at 1.30pm. “What puzzles me, is that we were told on Tuesday night that the game would go ahead on Wednesday. All the staff and players were notified and arrangements were made to make the trip the next day. We checked the weather reports at Stoke and they said that overnight conditions hadn’t worsened; yet when they call in the ref on the Wednesday morning, he says ‘game off’. It amazes me how they come to these decisions’. The fans had a rough deal on Saturday so I’m glad they didn’t set off on another wasted journey”. The match programme sold on the night was the same one from the original tie called off on 28th January. “These people have got to be the best in the land. Many would have taken the day off work to travel down to Stoke and they would have lost a day’s pay. Anyone who bought a ticket for the match has to use them next Monday – they cannot be refunded!”. The officials & players traveled down on the Sunday to give the players a rest once they arrived and make sure they were ready for the game, despite the postponements over 1,000 Blyth fans still made the trip. Unsurprisingly the recent poor weather made the pitch very muddy and heavy under foot, as the first team entered the pitch they were roundly booed by the home fans, however not for the first time that night the Stoke fans were in fact booing their own side, it was the Potters who came out first wearing their away kit of yellow shirts blue socks & blue shorts. Blyth had planned on avoiding a clash with their own stripes by wearing their newly acquired Bukta away kit of green shirts with white arms. 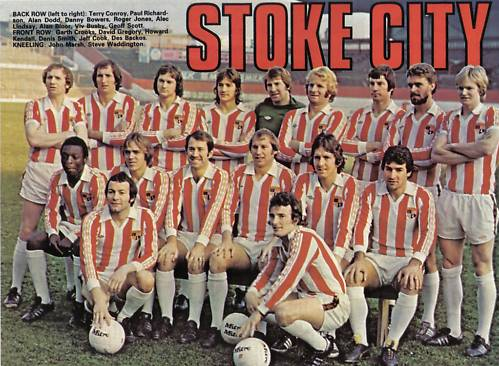 However the new kit featured white shorts & white socks as did Stoke’s home kit and referee George Nolan ensured there was a clear distinction on a dull & dreary night by making City wear their away kit. 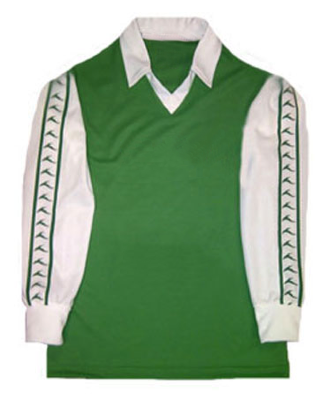 It was the 3rd kit worn on the cup run having previously wore the famous green & white stripes and also a white shirt with green trimming on collar & cuffs, while the new Bukta kit appeared new & different to some it was in fact the same style worn by the team back in the 1950’s when the home kit wasn’t stripes but this exact style of green body with white arms. As the game got under way the slippery surface appeared to give Blyth some problems keeping their footing, Viv Busby got through the Blyth defence for an early chance but Dave Clarke saved well. Terry Johnson accepts the gift to put Blyth 1-0 up. 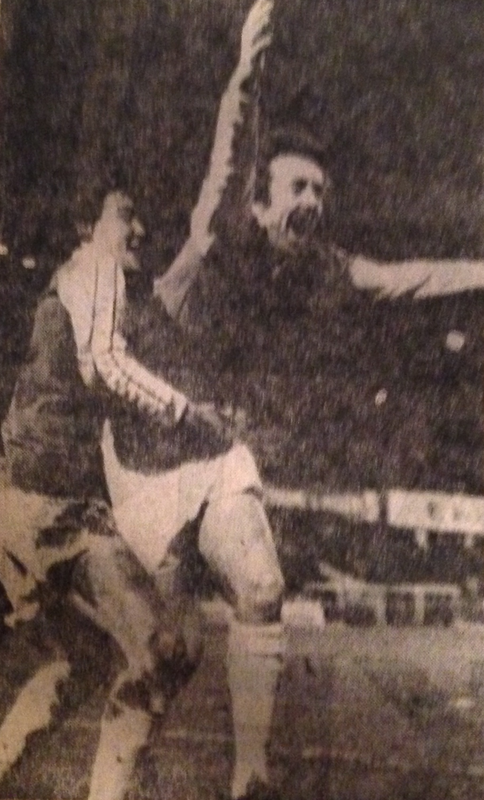 was fumbled by City keeper Roger Jones, unchallenged Jones allowed the ball through his hands and fell at the feet of Terry Johnson and the forward stabbed home his 14th goal of the season. Steve Carney grabs Johnson as he turns to celebrate his goal. 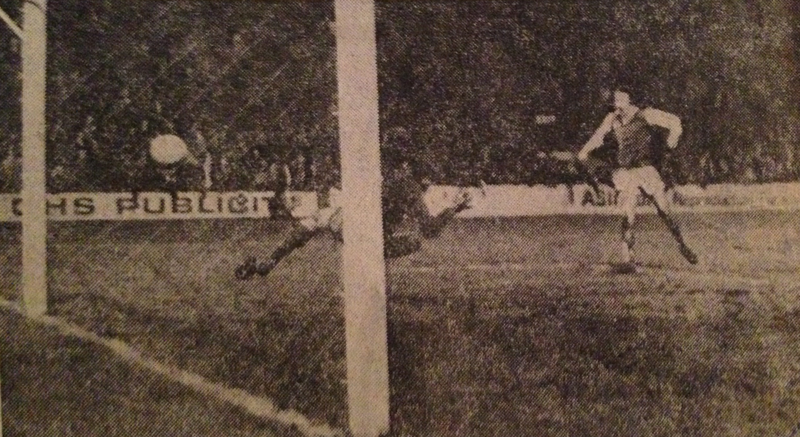 Terry Conroy missed a good chance to equalise when missed his kick with only Clarke to beat. Naturally the goal lifted the Spartans as they had to soak up the increased City pressure as the half went on, but Blyth held on relatively comfortably until half time although Ron Guthrie had to throw himself across goal to head clear a Howard Kendall pile driver and with their noisy Spartans following on the Stoke End terrace right behind them went into the break leading, it was turning into a difficult night for the home club. The half time talk clearly galvanised the Potters, Garth Crooks missed a glorious chance 10 minutes after the break collecting a Scott cross he then launched his effort over the bar and minute later Viv Busby was just a guilty skying his effort wide. The pressure finally paid off in 57th minute when they drew level, a free kick was deflected into the path of Viv Busby and he made no mistake find the back of the net with his low drive. 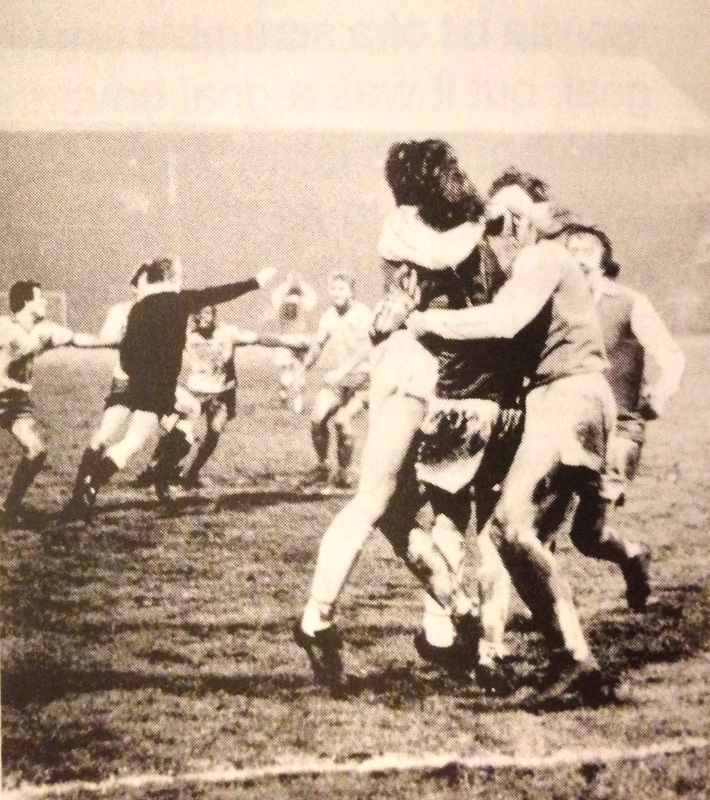 Before Blyth had a chance to compose themselves the home side had the lead, a corner was flicked on and Garth Crooks dived to head home at the far post. Tempers frayed Terry Johnson & Garth Crooks clashed, both received yellow cards for kicking out at each other. Blyth appeared to tire as they chased the game on the heavy surface but kept their composure continuing to pass the ball and got their just rewards from a free kick. Steve Carney celebrates his equaliser. Steve Carney is mobbed by his teammates as the Stoke player appeal for offside. 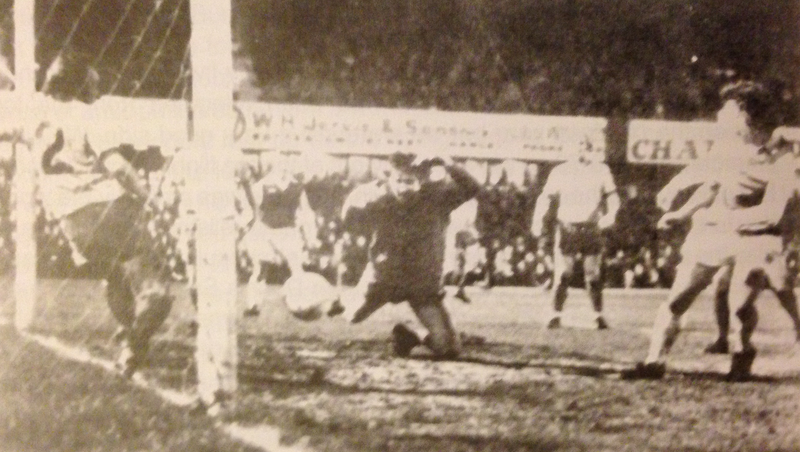 Ron Guthrie stepped up to take the kick but saw his thunderous effort crash into the wall, the ball spun up over the Stoke keeper and onto his left hand post. Alan Shoulder reacted the quickest and got to the rebound but his header amazingly hit the opposite post before falling into the path of Steve Carney who hammered it home to level the scores as the Stoke defenders appealed in vain for offside. While many inside the ground were thinking Blyth had deservedly got a replay the unthinkable happened with only seconds left following another Blyth free kick. John Waterson’s free kick from the right just reached Keith Houghton on the edge of the penalty box, he headed into the penalty area towards Rob Carney who just managed to get a touch, his flick took it past the defenders and inadvertently into the path of the on rushing Terry Johnson. 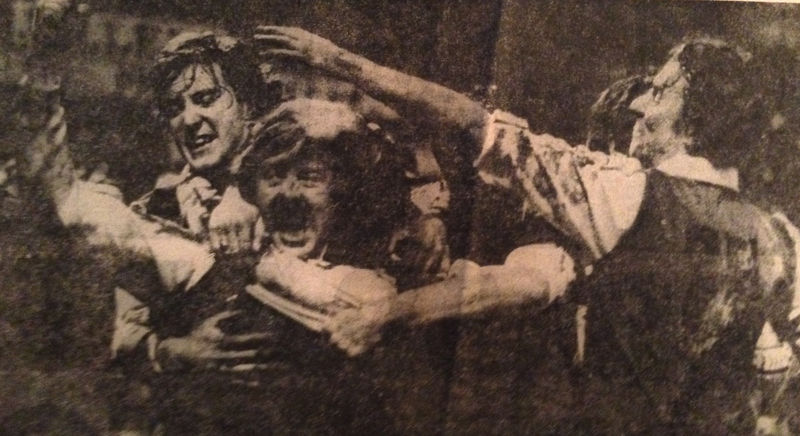 The former Brentford forward hammered it past Roger Jones to put the Spartans 3-2 in front and seal the club’s greatest giant killing before celebrating behind the goal with the traveling Blyth fans. “This is the greatest day of my life, I can hardly believe what has happened. I’m really pleased for the supporters, they have followed us so far and this must be great reward for them. I don’t miss chances like that! Brian Slane and his players salute the traveling fans. “I might as well retire – what else can I do after this?. They came back from the dead tonight. This is the supreme moment of my career. What else can I do now; I’m in only my first season as a manager. 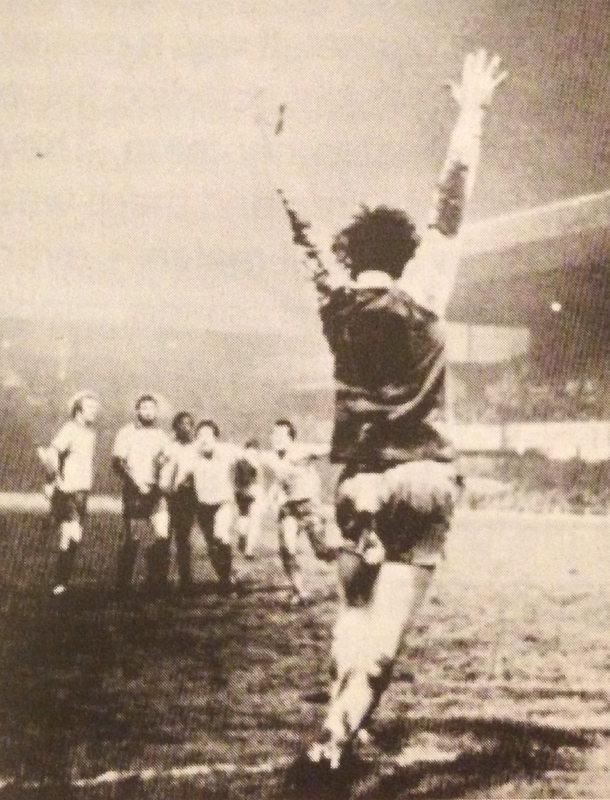 When we got the free kick that led to the equaliser I said to Jack Marks that we would score from it – and we did. The last gasp goal came out of the blue – it was just fantastic. Terry Johnson is tremendous. He hurt his knee in the first half but he carried on and was there when it mattered. Players celebrate in the dressing room. “The lads in the dressing room were high as kites after the win, I was in the shower still trying to take in what we had done when the news came through – Newcastle had lost 4-1 at Wrexham. For a moment or two it was like a heavy clouds descending my first reaction was anger, we had been let down once again by United. All the lads felt disappointed, we wanted that game so badly, and you know why?. It wasn’t just because it would have been a fantastic match for the club and the region, it wasn’t that it was because we would have beaten them, we knew we were the best side in the North East and this would have been a chance to prove it, but there was nothing we could do the chance was gone the gloom quickly lifted and almost immediately and the part continued!”. “It was a great performance by them tonight, naturally we are sick but we wish them all the best in the next round. They did well tonight, they came for a result and got one. We relaxed after we went ahead. I thought they had gone a little bit but they pulled it back well. 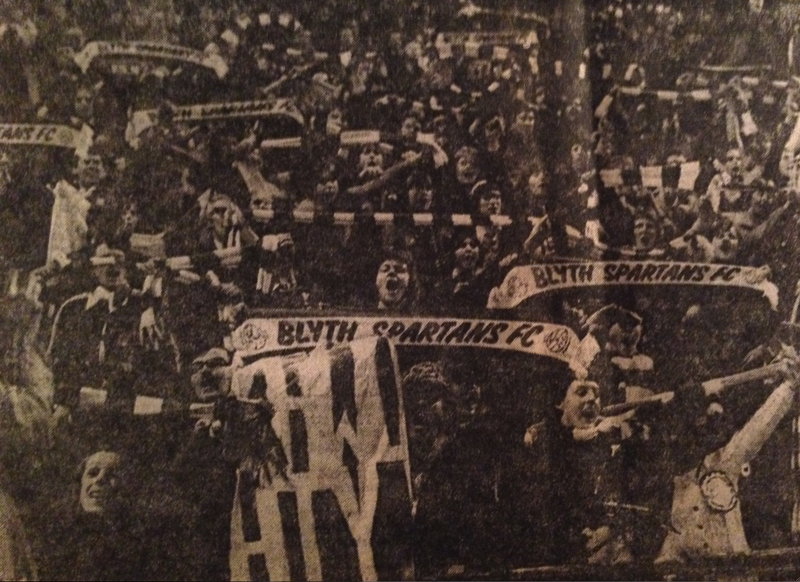 Stoke fans were devastated and while the majority were gracious in defeat and acknowledged what they had witnessed by applauding the Blyth Spartans players from the pitch, many vented their fury with scarves and season tickets being tossed from the terraces and onto the cinder track. It was a bitter pill for many to take it with it being in their own back yard, six years after the club had lifted the League Cup at Wembley and just three seasons after we’d almost been crowned League Champions and gone close to knocking Ajax out of the UEFA Cup for many fans it was the lowest point of their decline and many felt the glory days were well and truly over!. 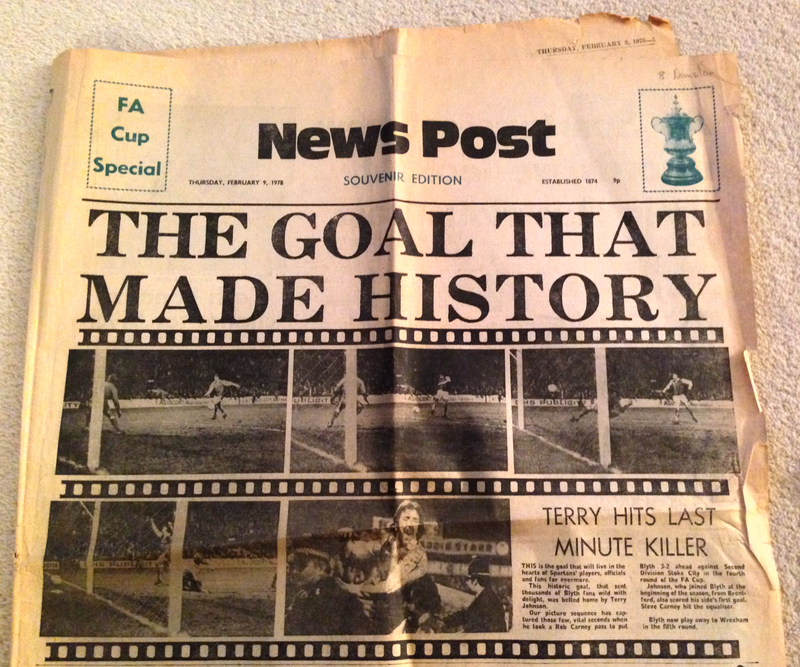 The local papers were all over the story, it even made the front page of the Daily Mirror the following morning!, that week’s News Post Leader produced a commemorative wraparound cover marking the achievement. 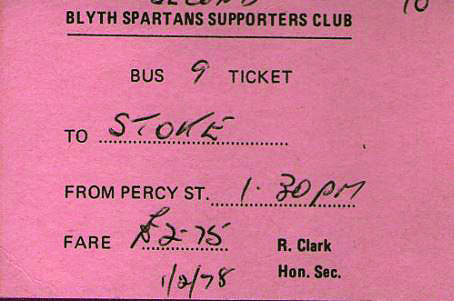 The next morning Labrokes Bookmakers slashed the Spartans odds on winning the FA Cup from 20,000-1 down to 2,000-1 and reported a ‘lot of money was being taken’ in the Blyth & Ashington shops!. Blyth were priced at 11-2 to beat Wrexham and reach the Quarter Finals. There was a victory celebration for the players held in the social club the following night. 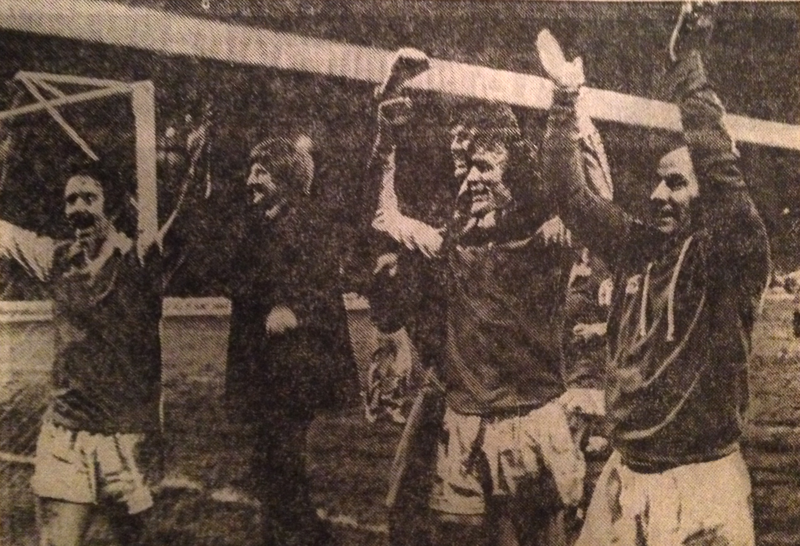 The players were joined by hundreds of fans to toast the historic achievement and were festoon with gifts the team were given a brand new set of Bukta strips (the would wear at Wrexham), all the players received a new pair of boots and were also given £400 worth of free bedroom furniture by a local Blyth company (the players were taken on a tour of the factory to pick what they wanted). The victory also earned the club the Result of the Round Award . The previous season Debenhams announced a new competition linked to the results in the FA Cup. Now in the second year of the Debenhams Cup, a new series of awards were announced. They were to be made for each round of the FA Cup where teams from the third and fourth divisions and non-league dubs were competing. They were to be presented to the team which, in the opinion of a ‘distinguished’ adjudicator nominated by the Football Association, put up the best giant-killing performance of the round, that is to say against a team from a higher division, the adjudicator was the recently retired international referee Mr. Jack Taylor. The ‘splendid’ away win at Stoke, obviously won the club the Result of the Round award. The victory also had a 79-year-old former miner from Ashington jumping out of his arm-chair!. “Blyth Spartans have always been a great team and I ‘m truly delighted with the Stoke result. I listened to reports coming over the radio and had visions of a replay until Johnson’s winner it was a great feeling”. 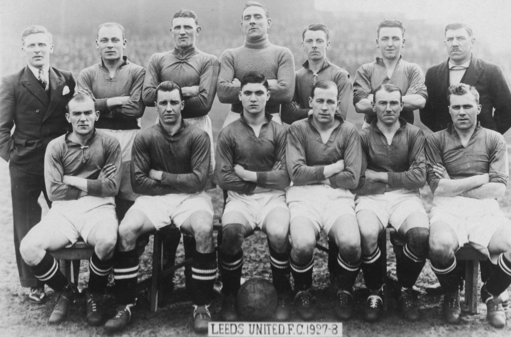 The imposing keeper pictured in the back row with his Leeds team. James Forster Potts was born in Ashington on 25th February 1899, he played at Blyth for 3 years while working as a coal-hewer at Ashington Colliery, it one of the most dangerous jobs down a pit and it helped build his ‘unique physique’ he was known to have hands like ‘shovels’. Jimmy was the main stay of the Spartans side until February 1926, when Leeds United made an approach for his services. “I went to Leeds and the two full backs in front of me were George & Jackie of the famous Ashington football family of the Milburns!. Jack in fact married my sister Bella. George Jack & myself became known in football as the Ashington Defence”. Jimmy made his debut within two days of signing, becoming firmly established at Elland Road. In his first two seasons he saw United be relegated and promoted back to Division One. After eight seasons as the accepted first choice keeper and club captain, he moved to Port Vale for a couple of seasons, during which he hardly missed a game amassing eighty-two League appearances. He then finished his career at Workington before returning home to Ashington to take up a job back at the Colliery. 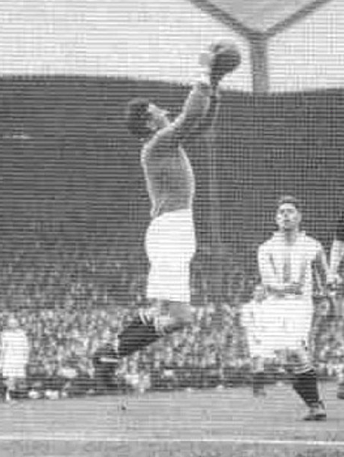 Jimmy Potts is regarded as Leeds United’s best goalkeeper of the inter-war period, Jimmy passed away in October 1986. The traveling Blyth fans celebrate the famous win. 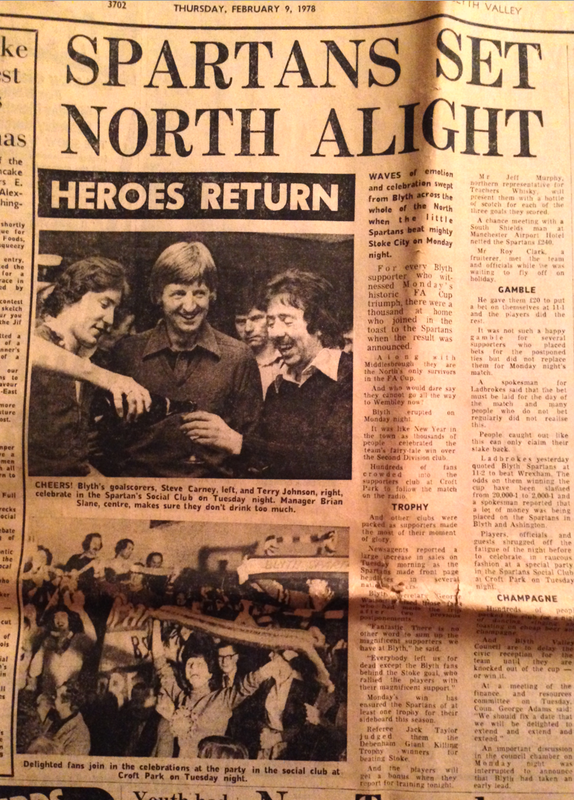 …..To a generation of Blyth supporters and many of the towns folk utter the name ‘Stoke City’ and it’s their ‘Kennedy moment’ they can instantly recall what they were doing or where they were on Monday 6th February 1978. It was the clubs greatest giant killing and a never to be forgotten night in the clubs long and illustrious history. Ken Sproat the oracle on Blyth Spartans history and of course his superb history book ‘We’re the Famous Blyth Spartans’ provided vital information. Fred Joicey formerly of Blyth now living in Weatherby who kindly give his collection of old news paper cuttings. 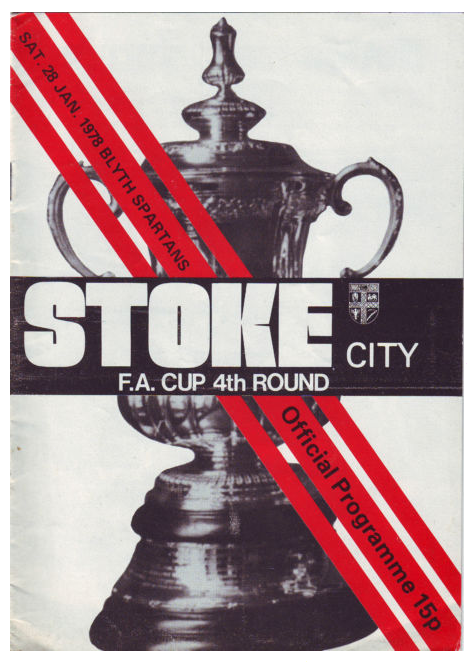 This entry was posted in Classic Matches, FA Cup, Giant Killings and tagged Alan A’Cort, Alan Bloor, Alan Dodd, Alan Shoulder, Alec Lindsay, Blyth Spartans AFC, Brian Slane, Bukta, Dave Clarke, Dave Varty, Eddie Alder, FA Cup, FA Cup Fourth Round, Garth Crooks, Geoff Scott, George Eastham, Giant Killings, Howard Kendall, Jackie Marsh, Jeff Cook, Jim Turney, John Waterson, Keith Houghton, Lawrie McMenemy, Newcastle United, Rob Carney, Roger Jones, Ron Guthrie, Ronnie Scott, Steve Carney, Steve Waddington, Stoke, Stoke City, Terry Conroy, Terry Johnson, Tommy Dixon, Tony Waddington, Victoria Ground, Viv Busby. Bookmark the permalink. First time ive seen that Alan Shoulder interview, excellent article.